Scott Joplin may have been the most sophisticated ragtime composer in his era—but he wanted to be so much more. And that was one of the reasons that Felicity Rag was published as late as it was, 1912, instead of when it probably was composed, almost ten years earlier. In the ensuing years, Joplin tried many more ambitious works, among them operas, but none of those met with any degree of commercial success (and, in fact, caused him financial problems when he tried to mount productions of them). Another reason perhaps was very practical: the publisher of several of Joplin’s rags, John Stark, had more than one of Joplin’s pieces on hand and wanted to “space them out” so that one was, in effect, not competing with another. Such was why Felicity Rag and Kismet Rag, both composed at about the same time, were released at different dates. Felicity Rag also listed a co-composer: John Hayden, who formed a working partnership with Scott Joplin that lasted many years. About the time Felicity Rag was published, Hayden left Joplin’s home (where he had been staying) in St. Louis and left for performing opportunities in Chicago. This had little effect on the rag’s success or failure, but it did dissolve a composition partnership that, while it lasted, had helped both musicians. And Joplin’s pieces frequently listed “co-composers” or “arrangers.” Joplin is reputed to have never quite mastered musical notation himself, so these collaborations were efforts to “clean up” any mistakes or missteps, even if Joplin was the sole composer of the actual music. 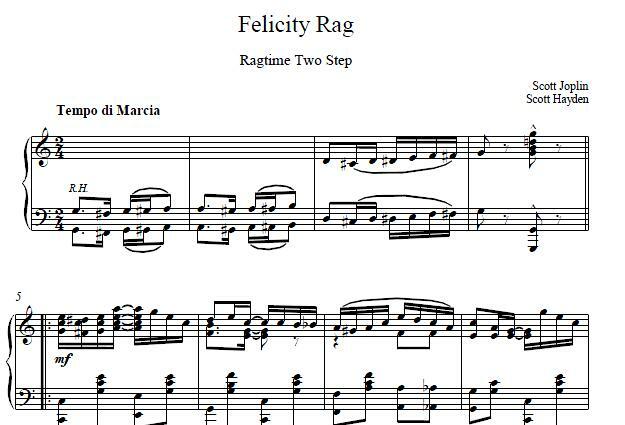 Joplin’s skill with hard notation may have been incomplete, but there’s no denying that Felicity Rag has all the elements of a quality composition. It’s a demanding piece to but well worth the effort: “felicity” is a term for happiness, something this rag definitely conveys. When you play this piece, enjoy it—that’s what “felicity” is all about!